How surprising that so often in prison women are set free. 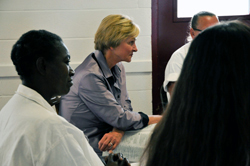 In one of our prison chapels the women have put up a banner proclaiming: God’s House of Freedom! Indeed, in that chapel there is freedom in worship, freedom in proclaiming His word and visible evidence of captives being released. What joy to join our Savior in what He is doing behind these fences. When the opportunity came to move this freedom into prison dorms, we accepted the challenge. The team began sowing into the lives of 56 women at the Murray Unit. That was six years ago. There were struggles and tears as we moved our classes into the hot dorms. The officers had to adjust to our presence. Sometimes we were exhausted. But our team of 20 volunteers continued. As Experiencing God teaches, God had given us a God-sized assignment that only He could accomplish. But He invited us to join Him. Now we have several hundred women in our Discipleship dorm program and over 200 trained volunteers. Our curriculum includes an Experiencing God weekend. Kathy Diaz and Tom Henderson organize these weekends and invite the volunteers from each unit to participate. God brings together a unity through prayer, teaching, worship and small groups. I received a letter from Christine, one of the women in the dorm sharing the impact of the weekend. Friday was really special for the new girls. Everyone was so excited! The testimonies and preaching were very good. God ordained the small groups and lots of walls came down. The songs were beautiful and the wind carried the music outside our dorm. We saw women walking along praising the Lord with us. But it was today that really touched my heart. We did not have a Chapel service. Lisa said, “This is the faith based dorm so let’s have our own service.” And we did! We set up chairs and the choir sang. Lisa shared on Mark 8. God was at work around us, and we joined him. Linda, I never believed how effective a faith-based dorm could be. Though not perfect, I know we are all being changed as we Experience God together. He is so faithful.